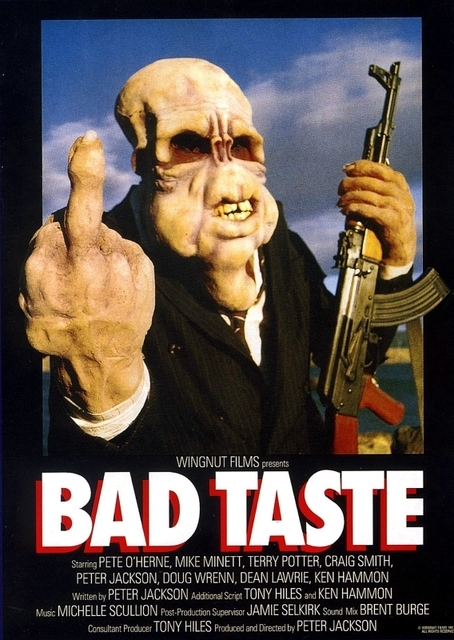 Bad Taste was always a film that stared at my whenever my family went to the video store. There it was, in the horror section, with an odd looking alien on the cover with an AK-47 in one hand and flipping me off with the other. I needed to know what this film was. Why was the alien flipping me off? Why did he have a gun? What the hell is this film? These questions were answered a few years later. I went to the video store and finally had the balls to rent the thing. I had no idea how made it. All I knew was what I stated earlier. I took the video home and was blown away by just about everything: the gore, the make-up, the homemade feel to the whole thing. I loved the film and had to find the director's other work. It wasn't that hard as I had rented the video around the same time that Heavenly Creatures hit theaters in the U.S. Peter Jackson has since become one of my favorite directors and I look forward to every film he has coming.